The ioDigital personalized shower system by Moen is pretty incredible. You can now fully customize your shower experience. You have the choice of multiple shower heads and water pressure along with temperature settings for each. Each ioDigital vertical spa by Moen comes with an overhead rainshower shower head, four body spray shower heads, and a four function hand shower head. The multiple shower head's settings are set by a water proof digital display installed wherever you want. There is also a hand held remote for turning on the shower without getting in. 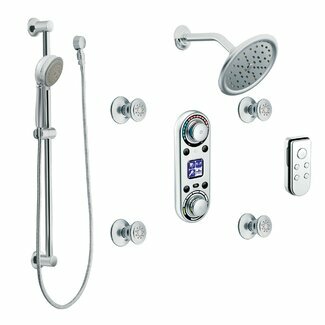 The ioDigital Moen shower is available in three different finishes chrome, brushed nickel, and oil rubbed bronze. It's really cool and futuristic looking, truly the shower you have always wanted. It has been getting great reviews and is available for purchase now. We have seen it priced below $1000 Here at the time of writing this.